Shaoxing University is located in Shaoxing, Zhejiang Province, China. It is locally known as 绍兴文理学院.The university was established in 1980. 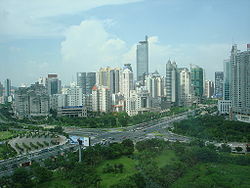 It is accredited by Department of Education, Zhejiang Province. Established in 1980, Shaoxing University is a non-profit public higher education institution located in the urban setting of the large city of Shaoxing (population range of 1,000,000-5,000,000 inhabitants), Zhejiang.